At the end of the war, the Navy had to decide how to handle the massive amounts of equipment that suddenly was no longer needed in daily service. 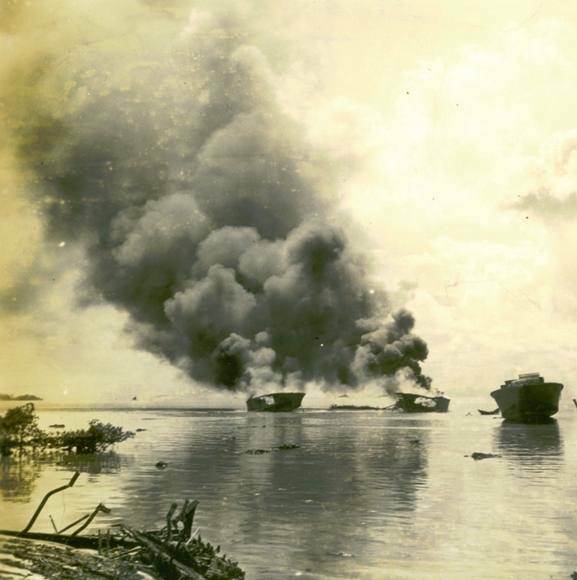 Many steel ships were sold off or "mothballed" into storage but many of the PT boats in the Pacific were simply stripped and burned. "After Ron 23 decommissioned I was waiting for transportation to Japan and since I had no duties, I spent my time watching the squadrons disappear, one by one. The following is a summary of the procedure. "1. 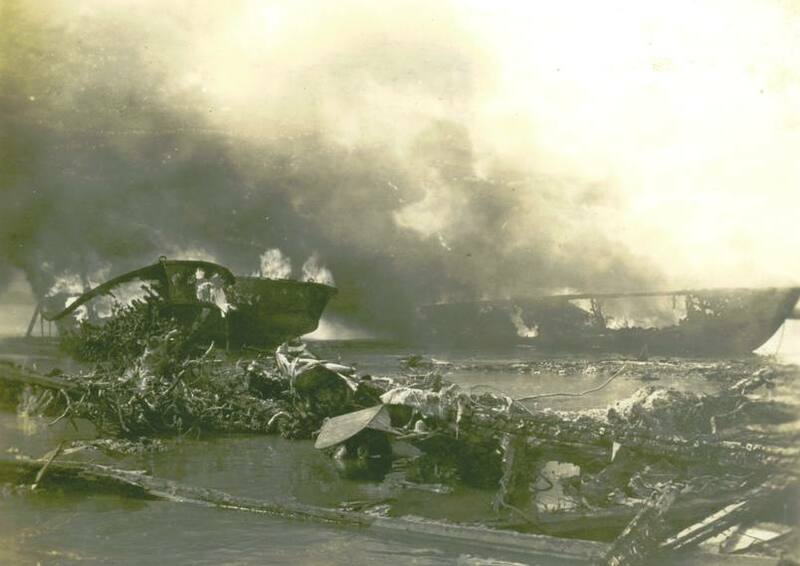 Boats marked for destruction were stripped of engines, armament, Title B equipment, etc. 2. On the day of the scheduled burning an LCM would place its bow ramp against the transom of a PT and would last it securely. The LCM would approach the burning beach at high speed and at high tide and run the PT as far onto the beach as possible. "3. At low tide the PT's would be high and dry. Working parties then dumped oil in the bilges. 4. After the entire squadron was lined up, the boat farthest upwind would be ignited by a flame thrower. The wind would then roll the fire down from boat to boat. "At this time the base forces had shrunk and Packard engines were piling up all around the work shops. The idea was to preserve the engines. No way could a handful of mechanics cope with 600 12 cylinder monsters. 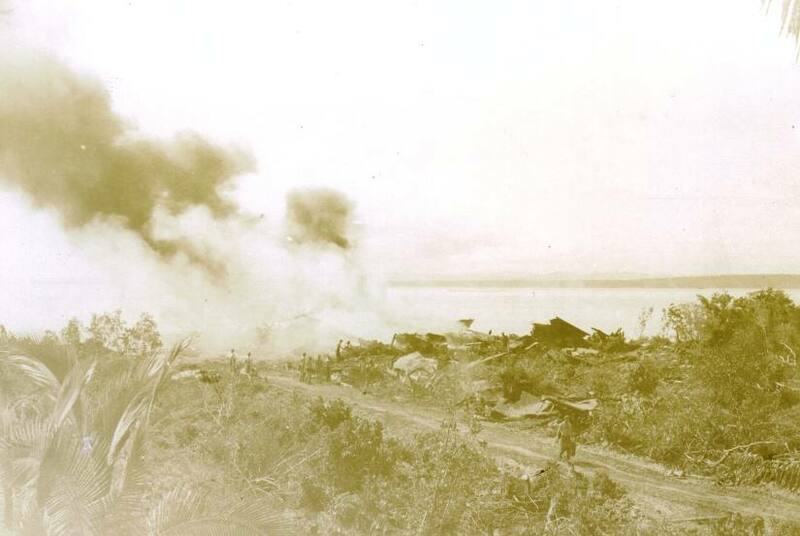 When I left, most of the engines and other gear were being reclaimed by the jungle. Maybe that's where we should go to find artifacts for the museum. "Other boats that had arrived from the states late in the war were mothballed and towed up the Manicani River (I think that's the name) and moored to palm trees in shallow water. I doubt that they are still there 55 years later. "I think that the photo of PT 170 is the saddest one. 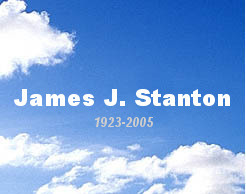 Ribs showing, gaping hole amidships and consumed by fire from stem to stern." The photographs Pop had in his collection show a scene that could be seen for miles. 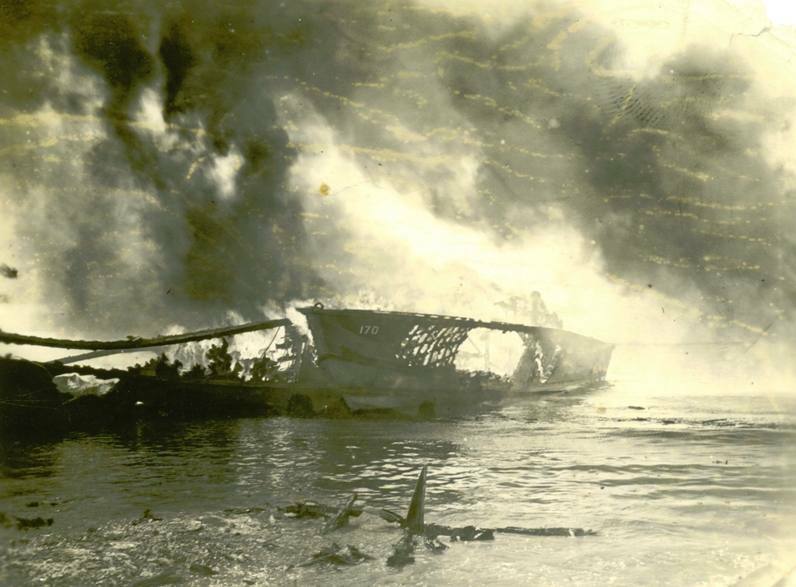 Sailors stood and watched the spectacle be repeated for several days while the boats were burned, including Pop's own boat, PT 243. "Pistol Packin' Mama" only had two weeks to go when these photos were taken; she met her fate just like the others on November 26th, 1945.